Life With a Whisk: Back in the saddle. I've missed you. Heat waves and overwhelming commitments shouldn't be an excuse, but it's the truth. I admit, I did make time to bake birthday cakes and birthday treats, but I might as well be chained to those at this point -- there's no way around it. 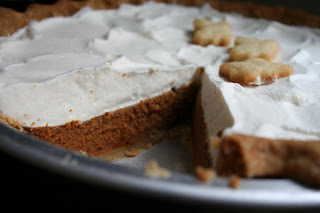 But, the weather has turned rainy and chilly, if only for this half of the week, and it's enough to be the kick in the pants I need to start baking for Tuesdays With Dorie again, and what could be more seasonal than a variation on pumpkin pie?? Things have finally settled down, and with Janell of Mortensen Family Memoirs choosing Caramel Pumpkin Pie, I have a feeling it's going to be a spectacular holiday season. 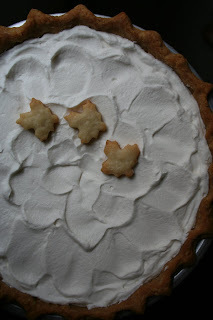 It's been awhile since I've made a pie, and was over the moon that this was my welcome-back recipe, but it's been so long that I was almost unsure when making the dough for the crust -- Was it wet enough? Too wet? What happened last time it was too dry? Everything worked out in the end with enough pinching and kneading (not the most ideal method, but it came together), and luckily holidays beget pies so I look forward to crust-making becoming second nature once again. The crust was baked and cooled, and then came the tricky part -- making the caramel. Sugar was cooked in a skillet on the stove until it took on a mahogany color (difficult to gauge with a black-bottomed, non-stick skillet) and smoking, with heavy cream and butter then added to it. I got the mahogany color and the melted sugar was smoking ever so slightly, but it seems it had just gone over the edge and there became a hint burnt caramel flavor. After it cooled, it was mixed into the pumpkin and spice mixture (no appliances necessary - hurrah! ), poured into the pan. 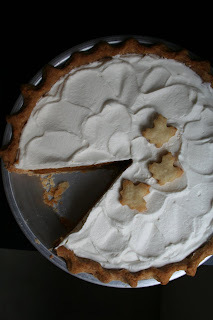 I realized at this point that perhaps a deep dish pie plate wasn't the way to go for this recipe. My love of crust runs deeps, so a deep dish pie with it's greater crust-to-filling ratio has my heart and it's a reflex to grab that pie plate every time. When I poured the filling into the par-baked crust, however, it only barely hit halfway up the pan. There was nothing I could do at this point, so off into the oven it went, spending about 10 minutes longer in there than projected. I refrigerated the pie overnight, and in the morning, upon examining my sleigh bed of a pie with its large sloping headboard, I decided a whipped cream topping would be the way to go. 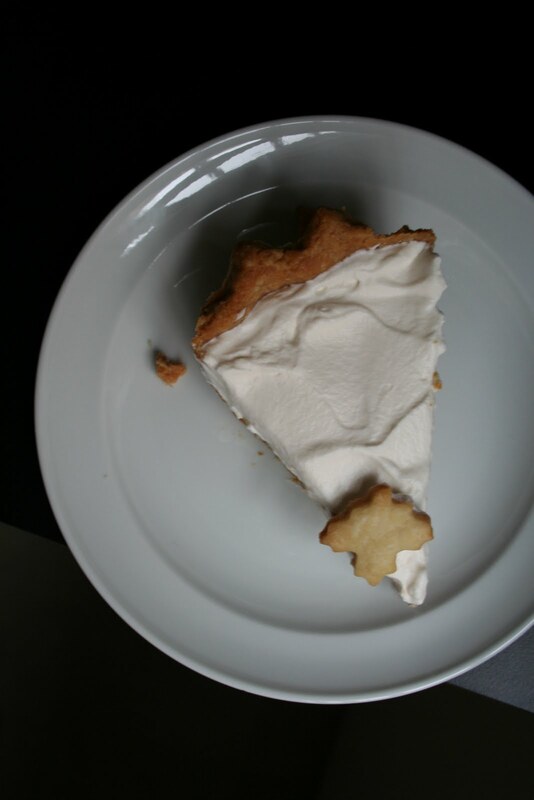 I added some Maker's Mark to the cream as I hadn't added any rum to the filling as suggested, and covered the surface with the fluffy, white blanket, letting it reach the rim of the crust. Its secondary purpose was mellowing the burnt caramel flavor of the pumpkin, which wasn't bad at all, in my opinion, and did add a certain depth to the delicious (but sometimes one-note)taste of pumpkin. I'd be interested in making the pie again and taking the caramel off before it turns mahogany and seeing which pie I prefer. So here begins another holiday baking season. I'm hoping it won't be completely overwhelming and leave me no time to blog, but it will surely be infinitely satisfying.